While YES bank is running a cool spend based offer to grab 5000 bonus points, here comes a similar offer during similar dates from HDFC bank. Not to wonder, because Yesbank credit card system is actually built by the ex-HDFC people but its surprising to see them compete at same time. While i haven’t received the offer for my Diners Black, i did notice the email has been received for one of my family member and here’s how it goes. I still wonder why they delayed the email by a week. The spend requirement for this card is Rs.18,000 while others have received in the range of 10k-50k. A pretty good offer to maximize your returns on HDFC cards. And just incase if you’re holding diners premium, you can swap it to Diners Clubmiles and get another 2X value if you redeem for airmiles. Note: The Diners Premium is no more available on their latest upgrade form as they have replaced it with Clubmiles, however Diners Rewardz is still there. This probably answers why Clubmiles look similar to Diners premium. Issue with my DCB: When i tried to check with Diners support on this offer, they are not ready to look into my ac and rather simply say that it works only when i receive the email. But the problem is i just never receive any such promo emails on my DCB in recent times while my family email accounts are flooded with at-least 10 promo emails a month. It seems i unsubscribed from them in my early days and i’m unable to get into their list even after month long escalations. Anyone else facing this kind of issues? This is a fairly a decent promo from HDFC Bank. They’re sending customised offers very often but the issue with them is that the benefit is too low to be attractive, except this promo. And also when you start spending more on your card, they stop sending such customised offers. The last targeted offer i received was on Dec 2016 and no such targeted offers received post that till date. Did you receive this offer and how much is your spend requirement? Feel free to share your thoughts in comments below. I have same issue with DCB. Apparently my email was not attached to my card account when they gave me the card, even though it was on my HDFC relationship. They started sending me paper statements. So I called them and added it later. But for whatever reason, I’m still not on their promo list. Or, they just don’t like me. Earlier these offers show up in paper statements and not on email or email stmts, even though the stmt look similar except that one line. But then i cancelled all paper statements sometime back, so i’ve no way to check my offers now. I get mailers, as part of Imperia banking & they consolidate all these kind of offers. On another note, yesterday when I checked into Plaza Premium lounge, with Diners card, I got a complimentary Power bank (PNY brand) – supposedly compliments from Diners – just in case anyone is interested and travelling any soon. Expenses on my black is usually avg 1lakh/month, I have received the offer to spend 27000 for 16-31 Dec, this one is lowest, as earlier I have received mails for spending around 2-4 lakhs..
One thing did you notice? The updated Upgrade form even though doesn’t have the Diners Premium anymore, it still retains the annual and renewal fees as RS 2500 instead of Rs 1000 for Diners Club Miles. HDFC always does this tiny mistakes every now and then! Mine is 36k. The catch is non 10x spends. I also received offer of 1500 reward points for every Rs.20 k shopping. You got both offers on the same card? I know one of my relative got the 1500 points per 20k on his DCB. I got 2x points offer for 25K spends, but I didn’t hear from anybody getting both offer. Yes i got on same card. Got mine as Rs 32K. Got the sms on 16th itself. The email came on 22nd Dec. So it is wise not to just depend on the email. It’ll be difficult to fulfil this offer as the target is non 10X spends and while I am spending internationally, all of it will go into 10X category eventually. Ah alright. So they’re sending this initially on SMS, same like Yesbank. But again DND is another concern to receive them. You have an option of selective DND. I allow banks and financial institutions. Rest I have blocked. It never works that way. The selective DND is just for name sake and is not implemented the way its supposed to. Just to mention, I didn’t get 2X offer on my Diners Premium though. Seems its targeted for very few. Out of 5 cards i knew, only 1 got the offer. Well i dit get 2 email…one is 3000 rewards point for 55k and 500 rewards points for 100k…just 500 for 100k, seriously? Seems to be the offer for business cards. Thanks for sharing. Can anybody tell me that Retail transaction also includes online shopping and topup wallets or offline swipe. Yes you can. But its better to stay away from wallet txns when it comes to HDFC as u loose normal points. True, as Siddharth said HDFC no more entertain Wallet load txns. If you fund your PayTM, PayZapp, Freecharge, OXIGEN accounts, you won’t get any reward points. I got a different offer on Regalia First. Its transact 4 times (no amount mentioned in the tnc) in Dec 2017 and get an amazon voucher worth Rs. 250 by March 2017. Since I don’t use this card at all, I think they just want me to start using it. Almost same as mentioned in Diners Rewardz !! I am NRI. Can I apply for credit card against my NRE FD In India? Usually NRIs usually can not apply for credit card for various reasons. I did not get any offers on my Diners Premium 😭. Although I must say I have shifted my spends now a days entirely to Yes First Preferred post the horrible devaluation in Diners Premium. Hey Sid, I have a cc only relation with HDFC with current limit at RS 4.17 lakhs. Will they upgrade me LTF Diners Black .. ? I mean the upgrade form clearly says of joining fees and renewal fees , is there any way of letting them know that I want it as LTF and should process the same only if LTF …?? Diners black is not available LTF, its only first year free. The forms are not updated. You can apply and check with customer care. Probably not. But if you spent a lot in last 6-12 months, that could help your case. You’ll never know until you apply. Even if not free, DCB is de-facto free as they give equivalent amount of points. If those points aren’t valuable to you (the travel portal, that is) then DCB is simply the wrong card for you as that’s the only redemption option. You lose the 1800 in GST though. Usually putting a standing instruction makes DCB free. That’s how it works for me. HDFC has a separate one-page confirmation form for Jet Diners, DCB, and Infinia. If you get an LTF offer, that form will mention Rs. 0 as fee. “Usually putting a standing instruction makes Dcb free” – can you please elaborate ? SI for repayment is what you meant I guess which I am ready to do 👍🏻. Anyway I need to make payment (which I invariably do via scheduled NEFTs ). Is there any mention/ form where this is mentioned ?? I mean if SI makes it effective LYT ( Forst year free and then waived because of SI ) I will be delighted ! Further , the upgrade form mention Joining/ Annual Fees as 10k where as site tell renewal fees of RS 5k only ( Forst year free as per form) which one is it ???? Do we get email only for those who recieve paper statements? I am subscribed to online statements and have not received any such email. 2. Spend 135000 and earn additional 500 Reward Points. #1 seems to be awesome one. Any upper cap in this promo? No uppercap mentioned Siddharth. Dont know how HDFC will honour its. So ideally if i spend Rs.40k i should get 3000 rewards points thats cool 7.5% return on top of 10X return or normal return. Ya there was no upper cap mentiones at the time of offer but now they have surprisingly mentioned it after the offer is over . I too got only 10k points. Got this offer too by email for 34k as the spend threshold on my DCB. Already met the target, let’s see when they credit the points. Diners is giving free power bank on lounge usage in Plaza Premium Bangalore. From my experience they never credit these points in the account, unless you mail or call them. In my case I will have to track the points and mail the customer care for the 10x or 2x points to be credited. I am still waiting for smartbuy and international transaction points which has not been credited even after 90 days. Got an offer DCB of 3X on Min spend of Rs 34K. Valid on online spends only. No upper cap mentioned. SMS says validity till 31 St Dec. and e mail says till 31st Jan 2018. Call center is clueless when asked about upper cap if any. Check with Diners/Infinia team. They could sometimes help by checking about it from the backend. Can you write about club mile diner new card from HDFC which is the better one dinner premium or dinner club miles. 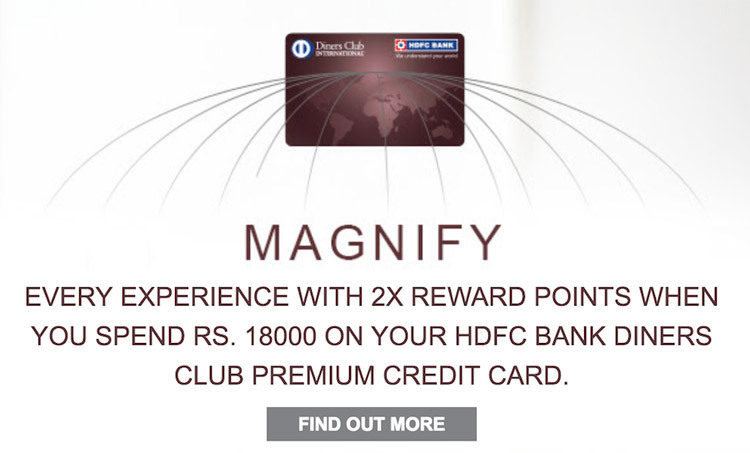 Just checked, got email saying spend 23k on Diners Club Rewardz for 2X………..capped to 2000 points only. I have repeatedly told them to upgrade my card, but they always said no offer is running on your card, so can’t update. Any idea how can I upgrade to DCP or DCB ? Kindly tell me how can I get any credit card ! I received mail of offer spend 15000 online and get 10x in period 15-31 jan.Max cap 10000 point. anyone else received similar offer? Has anyone got the points for the uan 10x offer. I am fighting with cc for last 1 month still theybare not honouring. They are absolutely dumb. I’m also facing the same problem, even after sending needful screenshots and escalated till Grievance officer. For me almost 30K+ rewards not honoured from various offers in last 4-5 months. spending more time in tracking and complaining to HDFC customer care,pathetic service. I have now esclated to nodal officers. 1) Spend Rs. 120000 and earn additional 2500 Reward Points. Offer Valid between 15th Jan – 31st Mar’18. 2) Spend Rs.15,000 Online and get 10X Reward Points. Offer Valid between 15th Jan – 31st Jan’18. Hi All, I got below 2 offers this weekend. 1) Spend Rs.15,000 Online and get 10X Reward Points. 2) Spend Rs. 180000 and earn additional 2500 Reward Points. Could you please check your emails as I want to check if these are generic ones or personal offers for me? I haven’t received any communication….. Neither did i. But called up support and they said its applicable for ALL. Just call up to re-confirm the same. Somehow I am getting 3 vouchers of BMS/Bignasket every month for last 4 months. Total 750 rupees. It’s good. But why? Any idea. I got diners black in 2017.